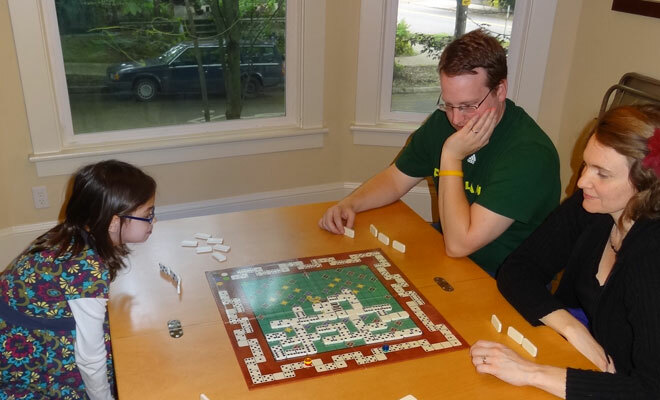 Overview: Double Double Dominoes is like a hybrid of regular dominoes with Scrabble . If you can play a domino that covers a scoring space on the board, you get points — but this game has some other tricks up its sleeves, too. Who Will Like It? Double Double Dominoes is a great family game: it’s simple enough for kids to learn (even kids younger than 8, I would guess) but can also offer a deeper strategic game for adults. It’s not a Euro-game with lots of wooden bits and a strong theme, but it’s a very solid game that can have broad appeal, and may be a good one to rope in a few non-gamers while you’re at it. The components are straightforward: the game board, 56 dominoes, and 4 scoring pawns. 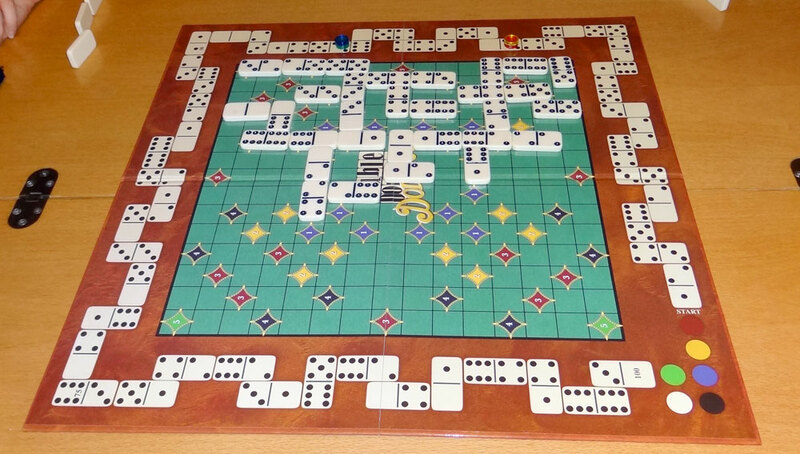 The board itself is what makes the game: it’s a grid that has numbered diamonds on some of the squares, and the scoring track around the border looks like a series of dominoes. The dominoes are standard-sized bone-colored tiles, and the scoring pawns are small translucent plastic discs. Each player starts with a hand of three dominoes, and the rest are placed face-down in a pile called the boneyard. On each turn, the player draws one domino from the boneyard and then plays one onto the board. The first domino has to cover the center of the board, and from then each domino played must match the end of a domino already on the board, just as in regular dominoes. There are some specific rules about how dominoes can and can’t be played — for instance, they cannot be placed parallel to a line of dominoes, even if they match on both ends, and they cannot be put into a corner where two other dominoes form an L-shape. The scoring comes in when you over up one of the diamonds on the board, which are numbered from 1 to 5 — the farther they are from the center of the board, the more points they’re worth. If your domino covers a diamond, then you score that many points. If you have a double domino (same number on both ends), then you get double the point value for playing it — plus, you can play a bonus domino from your hand as long as it can connect to the double you just played. The game goes to 100 points for a 2 player game, 75 points for a 3 player game, or 50 points for a 4 player game. I haven’t actually played a lot of dominoes, really. Generally when I do have a set of dominoes I’ve had more fun trying to set up a chain of them to knock down rather than actually playing the tile-laying game. However, the Double Double Dominoes board adds some new dimensions that I really like. First, because you have to get to the diamonds to score, you’ll want to play diamonds that lead to that area — but you also don’t want to make a path to the high-scoring diamonds for your opponents. That tension makes for some fun moments, particularly because you don’t know who has a double domino. What I really love, though, is the scoring track. Since you can get points on somebody else’s turn, that can affect what other people play. If you pay attention to what numbers you and your opponents are sitting on, you can force others to make difficult decisions. For instance, you could play a tile that makes the 4 or 5 diamond accessible to the next player — but only if they give you three points. Between that and the extra move for playing a double domino, I’ve seen scores rapidly shift in a single turn. Calliope Games has a planned expansion that will allow you to play up to 6 players, which I think would be a lot of fun, too. 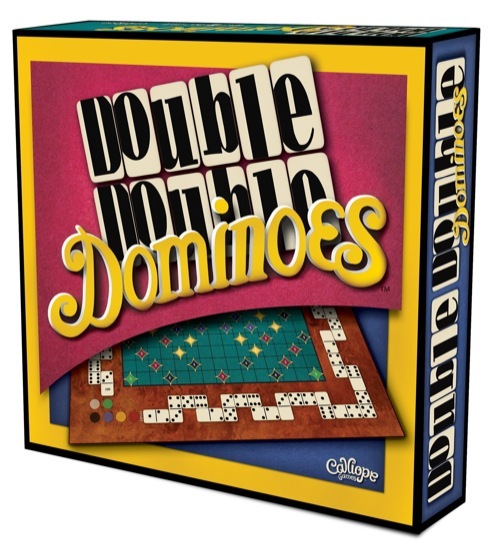 You can find out more about Double Double Dominoes and purchase it at Calliope’s website, look for it at your local game shop, or order it from Amazon. Wired: Easy to learn; great for non-gamers; scoring track adds a great twist. Tired: Won’t satisfy your heavy-strategy cravings. ← Does Cory Doctorow Think The Matrix Got It Wrong?